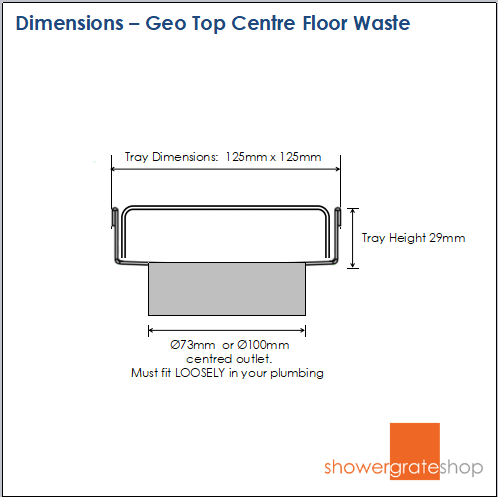 The Geo Top centre floor waste will complement your Geo Top shower grate or is perfect on its own. Marine grade stainless steel. This product is made to order and can take up to 5 business days to despatch. Fast track option available below for $70. Earn $4 Reno Dollar for purchasing. Set your exact requirements for width, length, outlet position and size for a perfect fit and easily integrated custom shower grate. Our highest quality 100% thick marine grade stainless steel shower grates to Australian Watermark standards. The laser welders used are aviation standard and are the benchmark of the industry, and all the products and manufacturing processes have been rigorously tested by NATA (National Australian Testing Authority) for both load and flow requirements. Do not settle for thinner products, lower grades of steel or poor welded seals - these grates are unbeatable! They are so well constructed that the manufacturer offers a lifetime guarantee. Shower Grate Shop invests in processes and skills to ensure the utmost in quality, luxury and longevity is built into their shower drains. Their products are trusted by industry professionals throughout the world. By making products that are beautiful, custom and functional, they are helping shape a barrier-free bathroom design. Drainage is governed by Australian Standards, and the drainage in a bathroom situation is a function of the bathroom drainage plumbing, the water-proofing, the drain apparatus, and the fall to the drain opening (usually tiles). Each of these contributors to the drainage in your bathroom may have a different tradesperson responsible so it is sometimes important that they are all aware of the planned installation technique. Importantly, your bathroom should be properly water-proofed with a water-proof membrane in accordance to Australian Standard AS3740 before installing the shower grate channel. This essentially means any water/moisture under your tiles will find its way to the drainage plumbing installed by the plumber. Innovative drainage flanges are now best practice to ensure this sub-floor moisture can exit the drain. They also protect the pipework from debris entering during construction (see the video). Stainless steel shower grates are designed to sit above the water proofing of your bathroom and simply provide a surface channel for surface water to the drainage plumbing, and they should not be allowed to interrupt the flow and escape of any sub-tile moisture which your water-proofing and drainage system has allowed for. The diagram below provides an illustration of the typical installation in a bathroom with a concrete sub-floor - it shows the situation where the water-proof membrane (green) has been laid on top of the screed (left hand side) and where the membrane has been laid under the screed (right hand side). This shower grate is suitable for both types of water-proof membrane application. Download the installation guide below for installation steps and further installation illustrations for timber floors and various grate positions (against walls, hobs, shower screens, etc). It is recommended that the steel tray and outlet do not contact the water-proof membrane, seal the drainage plumbing, or be sealed to the drainage plumbing, so any moisture in the tile bedding/screed can escape. A build up of moisture in the screed can ultimately cause damp/mildew and tiles can dislodge. See diagram above. It is also recommended that the membrane is completed before installing the shower grate. If the membrane is integrated with the stainless steel shower grate, differences in the expansion and contraction rates of hardened stainless steel vs surrounding building materials can result in the membrane weakening or splitting where it joins the steel. Your licensed water-proofer can advise you on the best methods for water-proofing your bathroom. Lifetime manufacturers warranty against manufacturing defects.